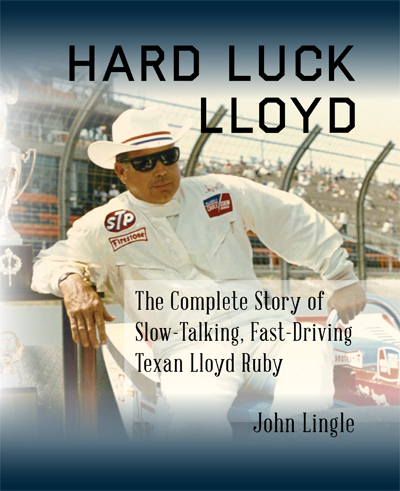 We are very excited to announce that Hard Luck Lloyd: The Complete Story of Slow-Talking, Fast-Driving Texan Lloyd Ruby, written by More Front Wing columnist John Lingle, is now available at Racemaker Press and will ship in time for Christmas! Hard Luck Lloyd is a display-worthy collection of stories and photographs from Lloyd’s long and varied life and racing career. Over 280 color and black and white photographs are interspersed with interviews from racing greats like Mario Andretti, Al and Bobby Unser, Johnny Rutherford, Parnelli Jones, and Dan Gurney. “Lloyd Ruby’s career is unfortunately remembered by most for one race and his horrible luck there,” Lingle says. “The one thing that all the drivers I interviewed said about Lloyd was that he was a true wheelman and that his career shouldn’t be judged by one race. Chief Mechanics Dave Laycock and Mike Devin gave Lingle a rare glimpse into the inner workings of a USAC Championship Car team and also gave their take on why Lloyd seemed so cursed at the Indianapolis Motor Speedway where he craved victory the most. Lingle also spoke with racing journalists and historians such as Donald Davidson and Robin Miller to help complete his portrait of a man that was loved and respected by his peers in the racing industry. Hard Luck Lloyd is available now for pre-order at www.racemaker.com and www.coastal181.com. Fans who place their orders soon will have their books in hand by Christmas as they will begin shipping during the first week of December. We here at More Front Wing are thrilled to assist with the promotion of Hard Luck Lloyd. Stay tuned over the coming weeks as we publish excerpts, run contests, and more to help spread the word!